On to the actual polish-- index finger is Nicole by OPI I Love You Cherry Much; middle finger is OPI The Spy Who Loved Me (gifted to me from sweet Sarah); pinky and ring fingers are my favourite red to date, butter London Pillar Box Red, with silver foil Orly Dazzle and The Spy Who Loved Me. 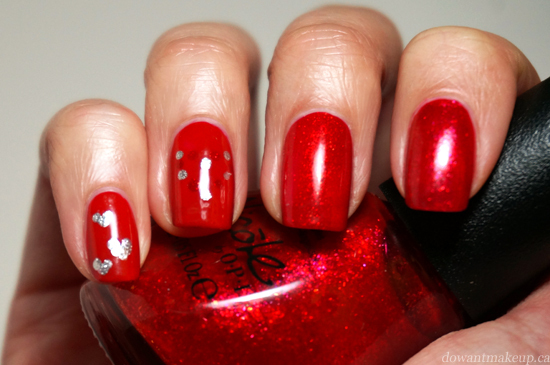 It's hard to see because The Spy Who Loved Me was unexpectedly such a close match to Pillar Box Red, but the ring finger has a heart made of alternating silver foil and red dots. Can you tell I am really starting to embrace red polishes? :D I Love You Cherry Much and The Spy Who Loved Me are close, with the former being more pink-y and less of a deep red than The Spy Who Loved Me. I Love You Cherry Much (these long names are killing me) features red flakies, which as you can tell by the photo, were hard to capture on camera. They're subtler than glitter or shimmer and add something unique to the sheer pink-red base. The Spy Who Loved Me is packed with very fine glass flecks that practically glow after a super glossy coat of Seche Vite. I love both polishes, but The Spy Who Loved Me has a slight edge for me because it reflects light so beautifully. 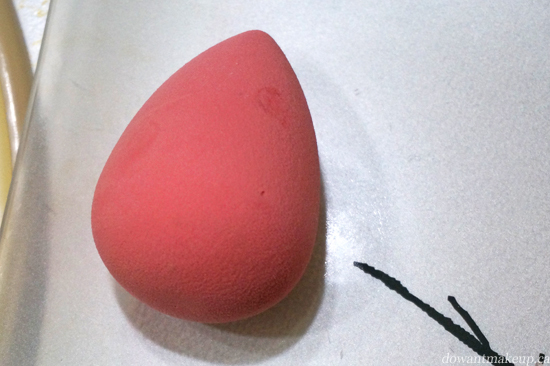 If you have a BeautyBlender (or like me, one of its many rip-offs), you know what a complete pain it is to get it squeaky clean again. For months I cleaned my London Drugs-brand sponge with a spray brush cleanser; while it couldn't remove all the foundation pigment from the sponge, I still desperately hoped it at least sanitized the poor thing. Then I found out one of my favourite places ever, Daiso, carried a magical liquid detergent that could cleanse your sponge of all your makeup sins. Sold! Here's my sad, dirty sponge. It looks gross but it's for science, okay? My sponge is my favourite way to apply foundation/BB cream, so it gets dirty pretty quickly. There is some fresh foundation that needs to be removed, plus some very set-in pigment that wouldn't budge no matter how much cleanser I sprayed on or how hard I squeezed. 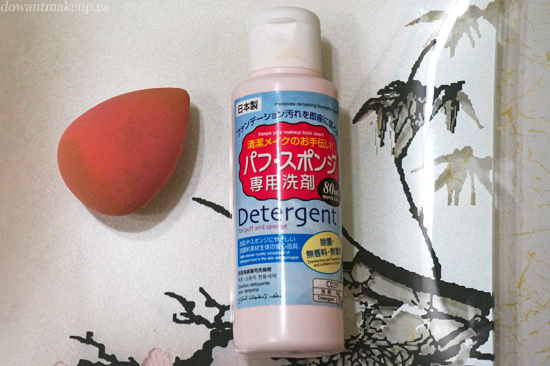 Labeled as a detergent for makeup puffs and sponges ("power sponge"), this pale pink bottle is found in the cosmetics section, where you would find makeup cottons and facial cleanser. The liquid detergent is very similar in texture to dishwashing liquid and is odorless. Although 80ml/2.8oz seems small, I only put a few drops on both ends of my wet sponge and squished away. After tons of brownish water came out of the sponge, I rinsed it and repeated the process until I was satisfied with the look of the sponge and the water ran clear. Soon enough, even the set-in pigments were out! Result: happy, squeaky clean sponge! It hasn't been this clean since before it met its first drop of foundation. I'm very pleased with how easily it removed the foundation, and for $2 it is five times cheaper per ounce than the Beauty Blender cleanser. There are a lot of posts out there mentioning use for makeup brush cleaning. Some say don't, some say it's okay if you follow up with conditioning. I do want to point out that nowhere on the packaging does it indicate use on a brush, just "puff and sponge". I haven't tested it on brushes myself, but I'm leaning towards okay on synthetic brushes with some conditioning, and very hesitant on natural brushes. I feel like the same ingredients that make it such a great sponge cleaner might be too harsh on natural brushes. Right now I'm satisfied with my current brush cleanser and use the detergent strictly for my sponge. 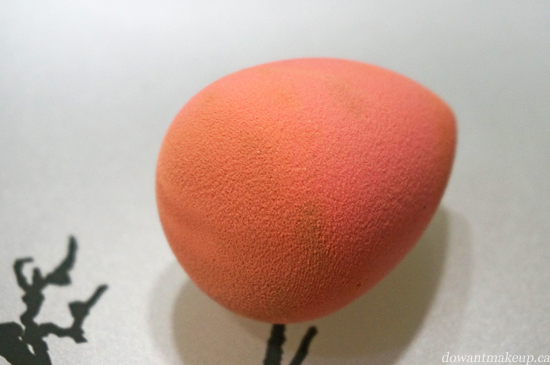 Do you use a makeup sponge for foundation? How do you get it squeaky clean? 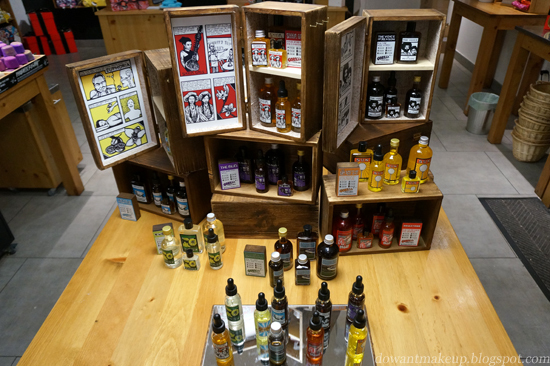 LUSH's new Gorilla Perfumes collection whisks Lushies away to new and exciting places with nine dynamic, innovative scents inspired by the British countryside, as well as its heritage, music, emotions, and literary figures. 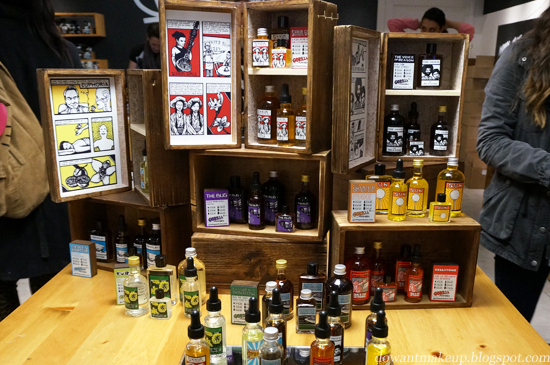 Each fragrance evokes a distinct image of the story behind it--many rooted in folklore. Furze is inspired by a British flowering plant of the same name that blooms even in winter. This plant is believed to have the power to protect a home from curses and if made into a broom, "sweeps away" evil influences. This perfume features coconut and vanilla for a warm scent. A tale of an English hillfort, haunted by Romans and sunken into the sea, inspired Flower's Barrow. Sage, thyme, geranium, and blackcurrant are used to capture the spirit of this ancient fort. This is probably the closest to a "floral" in the collection, but it's a very, very earthy floral. As its name suggests, Euphoria is co-founder/perfumer Mark Constantine's attempt to capture the rush of euphoria that can lift and invigorate a heavy heart. This perfume draws its cheerful fragrance from clary sage, grapefruit, lime, and neroli. The Sun is inspired by Mark's roadtrip to Cape May, New Jersey, while listening to Simon and Garfunkel's "America". This is intended to be summer and sunshine in a bottle, with notes of orange, tangerine, mimosa, and sandalwood. It is similar to Euphoria due to the citrus notes, but Euphoria is greener. This was my favourite of the bunch for its citrusy brightness; on my skin it smelled a bit like orange juice (and not in a bad way). I've been kind of an absentee blogger lately *hangs head* Due to work stuff, I haven't had much time to get a full night's sleep, let along edit photos and write posts! I really am in awe of people that have full-time jobs/families/other responsibilities and still blog consistently. I just really felt the need to post something since it's been a week from my last post T__T I promise it won't be that long until you see the next one!